Sound the conspiracy theory klaxon again! But a bit louder this time! The Associated Press reported on Tuesday that the federal investigation into alleged doping carried out by Lance Armstrong’s US Postal team has uncovered “corruption to the core”. But don’t get too excited just yet: AP’s source is “a person familiar with the investigation”, which sounds like it could be any of us, depending on how you define “familiar”. Still, at least the news agency has uncovered a mystery that has long perplexed some of its more unintelligent American readers: apparently it was “in France where Armstrong became famous by winning the Tour de France seven straight times”. So that’s how the race got its name! And speaking of mysteries, The DYNAMITE! 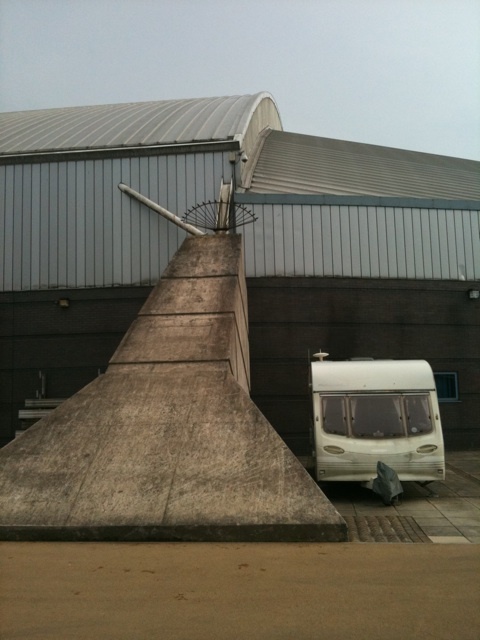 Files was left to ponder the possible purpose of a scruffy caravan which we spotted parked next to the VIP entrance of the Manchester Velodrome on Saturday evening. It must be there for a reason, because British track cycling is all about the aggregation of marginal gains, isn’t it? Our theory: when the pressure of all that aggregating gets too much, this is where Dave Brailsford goes for a bit of “me” time. With his spreadsheets and cocoa. And a clipboard. Securing his record third appearance in our weekly rundown, Boris Johnson turned up half an hour late at a Hillingdon school for the launch of the latest Sky Ride cycling event because he, er, choose to take the tube instead of using his bike. Maybe the Mayor of London was afraid of getting a flat. The Uxbridge Gazette revealed: “A few of the children showed the mayor how to find and fix a puncture in an inner tube. Charlotte Masters, aged nine, said: ‘I think he understood it. '” Let’s hope so, eh? After this week’s tragic events, the Giro needed some sort of light-hearted moment to soften the mood – and Cycling Weekly duly obliged yesterday with the romantic tale of the underwear model and the professional cyclist. If CW is to be believed, blonde hottie Doutzen Kroes and race leader Pieter Weening could soon be an item, chiefly because the two of them hail from the same Dutch city and she tweeted the word “lokwinske” – which apparently means “congratulations” in their native tongue. Now, the DYNAMITE! Files is a big fan of the whole romantical-getting-together thing, but is one word tweeted to a third party ample grounds to conclude that she’s likely to call him? Remember, CW: if poor Pieter’s heart gets broken, you will be the ones to blame.